I’ve been getting a lot of readers asking for an update on our family room progress. Let’s just say it’s slooooow (you’ve heard that before right?). We took about 6 weeks off due to crazy schedules with work, family, and the Vex (my husband runs the club and leading up to our trip to DisneyWorld was so busy with them working 4 nights a week or more on robots). This part of the project is all in the hubby’s hands. I’m VERY very good at destruction and demo, and am handy with a paint brush and finishing, but since we’ve never hung drywall before and I’m not to be trusted with power tools (no, really) I left that up to him. Of course like anything with our old house nothing makes sense. Electrical and cable running places it shouldn’t be, walls that aren’t even close to straight, and other oddities make every task 12 times harder. Over the last few weeks there has been lots of measuring, sistering of studs (adding another board to make it the same length as the rest of them), more measuring, cutting, and hanging, screwing and spackling. 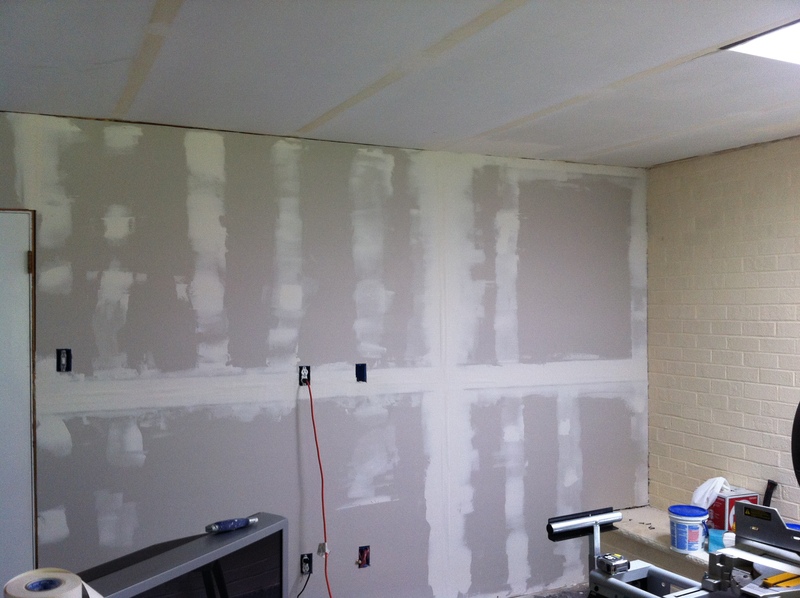 Right now we’re working on more spackling, and soon we’ll come to the part I dread. Sanding. It’s still too soon to tell if our rookie DIY work will pay off, but considering the cost savings, how fulfilling it is to do it ourselves, and how dramatic of a difference the renovation has already made I can’t wait to see the finished product. Next on my agenda? Picking paint colors for the walls, and ceiling and carpet for the floor. For the walls I’m thinking I will keep it tone on tone with the same creamy white I picked for the fireplace and I’m considering painting the ceiling the same color as well since it drops down into view from the kitchen, and having it be white would probably be too stark of a difference. We’ll also be hanging crown molding to hide all the imperfections in those areas (easier than taking down the whole ceiling we thought). What colors would you recommend? keep in mind it’s a dark room with little natural sunlight (aside from the skylight). What kind of carpet do you think we should use? I like the one you picked, but wonder if it’s light enough to show dirt and such. I might go a shade darker. But not a fan of the yellow tones Kris seems to like. Who are all these men commenting on your blog?! Looking good! Too bad you had to take a bit of a break but it’s looking way better than when we spoke in February. 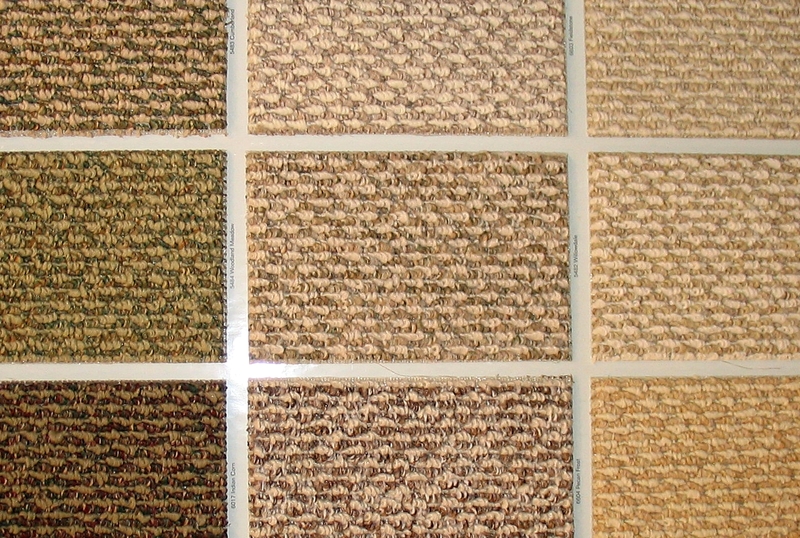 I like the right column, middle row carpet – slightly more tan/yellow than your choice? Let me know if you need any painting advice – I have too much useless knowledge from working with my Dad back in the day that I don’t use at all at work. I’ll be looking forward to the next update! Not sure about the carpet, but for the sanding, you can get these things at home depot that are like sponges with sandpaper on them. You get them wet and start sanding, and it really cuts down on the dust. Peter, thanks for your input! I agree. I remember wanting to lay on that carpet. Made playing with the kids so fun. We actually have a berber like the middle sample there in our basement living area, and we love it. Easy to take care of, and feels nice on the feet. I think that top middle one would be a good choice.